Welcome to Easton Animal Hospital! 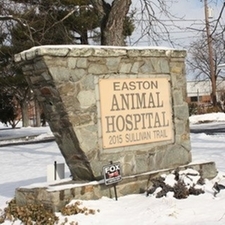 Easton Animal Hospital is a full-service veterinary facility located in Easton, PA. Our professional and caring staff strive to provide the best medical care for your pets. When your pet becomes sick, diagnostic tests can be done right in our hospital to provide prompt and thorough medical care. We offer surgery, dentistry (complete with dental x-rays), acupuncture, VOM treatments, 3LT laser therapy, USDA health certificates, on-site bloodwork and urine testing, digital x-rays, ultrasound, and a pharmacy in the hospital.